Denise is originally from Minnesota and was active in her church growing up. 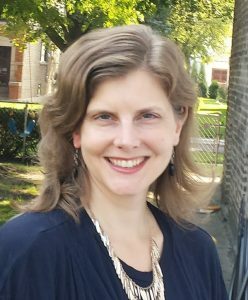 She majored in Sociology and Spanish at North Park University and at the University of Chicago she obtained a Master’s degree in Social Work with an emphasis on public policy and worked with homeless teens through a program sponsored by Asian Human Services. From there she sensed a call to ministry and attended North Park Theological Seminary and graduated in 2004. Denise and her husband Gus got married in 2005. They spent seven years in Indiana, where she pastored a church. They moved back to Chicago in 2011. During the last several years they’ve been members of Resurrection Covenant Church. Denise and Gus have two sons, one in third grade, and one in kindergarten. We are looking forward to having Denise at Ravenswood Covenant Church and to our ministry together.